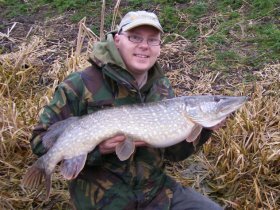 Traditionalists suggest that the season for targeting pike (Esox Lucius) opens on the 1st October with the close coinciding with the close of the fishing season, and particularly the rivers, drains and large glacial lakes, on the 14th March. Despite this, pike anglers are free to pursue their quarry at any time of the year, although many fisheries do not allow fishing for pike during the spring and summer months. There is no doubt that the number of anglers fishing for pike drops dramatically once the pike start spawning around April; picking up again from September. Cast your mind back to the last time you expended a lot of energy. Maybe you walked up several flights of stairs, ran to catch a bus or visited a gym. You were probably out of breath so you rested for a while, took deep breaths or sat down for a few minutes, thankful of the chance to recover. Despite their fearsome reputation, Pike are very delicate. They expend a lot of energy when hooked and this causes their oxygen levels to drop. We then remove them from their natural environment to remove the hooks, weigh them and take a few trophy shots. When we are ready to return the Pike to the water we must consider the effects of the experience on the fish and help them to recover before allowing them to swim off. We do this by supporting the pike in an upright position in the water for a few minutes. With one hand we hold the root of the tail; the other hand may be used to stroke her belly. The Pike will blow bubbles out of its gills, which it does to expel the excess air it has gulped while out of the water. With a strong kick of her tail she tells you she is ready to go. You may even get a cold shower for your trouble. Summer is a time of low oxygen levels in many of our waters, making the Pike particularly vulnerable to excess stress. If you add to this the potential for poor handling by occasional or warm weather anglers there is an increased risk of fatality. Because of this, many experienced pike anglers observe a self imposed restriction on summer Piking, waiting until the first of October before wetting a line. It would be incorrect to compare the ethics of fishing a shallow lake, drain, canal or river with the deep, cool waters of a glacial lake. For some pike anglers the break from local piking during spring and summer is an opportunity for a trip to Cumbria or the highlands of Scotland. These huge waters are very slow to warm up and may never reach high temperatures or low oxygen levels. Anglers who consider these vast inland oceans to be their primary or local venues may find that the conditions are such that it would be impossible to ever get onto the water if a summer break was enforced. Whenever you choose to go pike fishing, always consider the welfare of the fish first. Do you really need to weigh and photograph every fish? Unhooking pike in the water will reduce the risks and may prevent unnecessary stress on the fish. Treat the pike with respect and make sure you have all the right tools required to quickly unhook and return the pike to the water. Thanks for your article. It is amazing how much stuff no one tells you about fishing. It would be good if the government licence website bothered to give you information as well as taking you money. I guess though they don’t want to say that if pike is you thing you only get 6 months for you money – the licence the becomes a pretty expensive tax. This is very interesting. I have seen some dead carp on the bank at my local water. I wondered what could have killed them and how they end up on the bank. I am now suspicious that these fish have been caught, returned only to die and be taken out of the water by another angler. Fish care should come before any other consideration.